Literature 1974, Part 1 Böhme S., Esser U., Fricke W., Güntzel-Lingner U., Henn F., Krahn D., Scholl H., Zech G.
Auteurs : Böhme S., Esser U., Fricke W., Güntzel-Lingner U., Henn F., Krahn D., Scholl H., Zech G.
Astronomy and Astrophysics Abstracts, which has appeared in semi-annual volumes since 1969, is de­ voted to the recording, summarizing and indexing of astronomical publications throughout the world. It is prepared under the auspices of the International Astronomical Union (according to a resolution adopted at the 14th General Assembly in 1970). 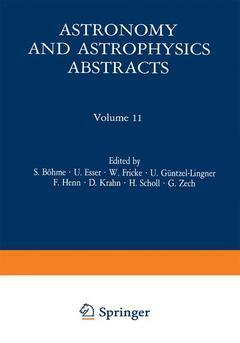 Astronomy and Astrophysics Abstracts aims to present a comprehensive documentation of literature in all fields of astronomy and astrophysics. Every effort will be made to ensure that the average time interval between the date of receipt of the original literature and publication of the abstracts will not exceed eight months. This time interval is near to that achieved by monthly abstracting journals, com­ pared to which our system of accumulating abstracts for about six months offers the advantage of greater convenience for the user. Volume II contains literature published in 1974 and received before August IS, 1974, some older literature which was received late and which is not recorded in earlier volumes is also included. Begin­ ning with this volume some minor changes of our classification scheme have been made. We acknowledge with thanks contributions to this volume by Dr. J. BouSka, who surveyed journals and publications in the Czech language and supplied us with abstracts in English, and by the Common­ wealth Scientific and Industrial Research Organization (C.S.I.R.O. ), Sydney, for providing titles and abstracts of papers on radio astronomy. Abbreviations.- Periodicals, Proceedings, Books, Activities.- Applied Mathematics, Physics.- Astronomical Instruments and Techniques.- Positional Astronomy, Celestial Mechanics.- Space Research.- Theoretical Astrophysics.- Sun.- Earth.- Planetary System.- Stars.- Interstellar Matter, Gaseous Nebulae, Planetary Nebulae.- Radio Sources, Quasars, Pulsars, Infrared, X-Ray, Gamma-Ray Sources, Cosmic Radiation.- Stellar Systems.- Author Index.